Jocelyn Evans is a Professor of Politics at the University of Salford. He is also an editor of Palgrave Macmillan’s’ French Politics, Society and Culture’ monograph series. His research interests cover European politics and electoral behaviour with a particular focus on France. He also works on electoral forecasting, especially predicting third-party support. Currently, Evans is working on a book on the 2012 French elections together with James Shields and Gilles Ivaldi. Gilles Ivaldi is CNRS Researcher, in the the Human and Social Sciences Department at the University of Nice. Six months ago, French political commentators began talking of an electoral ‘blue wave’ – Marine Le Pen’s high polling figures. In some cases she captured more than 20 per cent of the vote, suggested that the new leader of the Front National (FN) was likely to outperform even her father’s best result of almost 18 per cent in the run-off of the 2002 French presidential elections. A less demagogic, ‘softer’ far right candidate appeared to have significant appeal to broad sections of the French electorate, including groups previously antipathetic to the FN such as women and younger voters. This wave now seems to have ebbed. 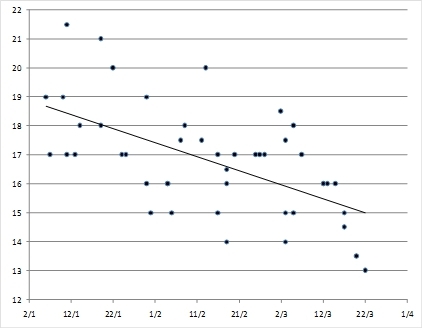 Since mid-February – the same time as Nicolas Sarkozy officially declared his candidature – the latest poll averages place Le Pen at 15 per cent, and definitely in a downward trajectory, as Figure 1 shows. Such a score would clearly represent an underperformance for the FN, and a patent failure of Marine Le Pen’s personal strategy to successfully normalise the party – dédiaboliser, to use the French word. It would also put an end to the much publicised ambition of the FN to disrupt the traditional Left-Right run-off as Jean-Marie Le Pen did with the record score in 2002. In a recent article published in French Politics, I argued that contrary to much received wisdom about far right performance in France and elsewhere, there are structural components to these parties’ votes which allow relatively stable forecasts to be issued at a distance. To what extent, then, do Marine Le Pen’s current fortunes concur with my model? The model of forecasting specifies the FN vote in national elections (presidential and legislatives) as a function of two socio-economic factors – unemployment and immigration, with increases in both resulting in higher FN score – plus a presidential ‘bonus’, corresponding to the expressive, anti-system vote Le Pen has traditionally received. Across time, statistically the model shows consistent stability and accuracy, with a margin of error of around +/- 1.3 percent across all elections since 1974. Notably, it would have anticipated the surge of the extreme right leader in 2002, as well as his electoral setback five years later. Because it is based on structural rather than short-term campaign-related factors, the model can forecast the FN vote some 6 months in advance of the election, giving this method a better lead-time than polls. Its raw forecast for Marine Le Pen in 2012 is 15 percent of the vote, which we adjust upwards using her performance in local elections to take into account an anticipated ‘change-of-leader’ effect. We estimate the new leader bonus at about 2 percent, giving a final forecast of 17 percent in the first round in April. This estimate is in line with the poll of polls taken at the same time, as well as with an expert forecast from 56 academics in a mini-survey conducted in November. Methodologically, our relying on earlier conditional forecasts of immigration may mean our estimates are too high. Shifting definitions and scope of immigration figures, partly for political purposes, have seen the numbers in fact drop, putting the eventual ‘real’ figure at anything up to 10% reduction in 2011, the reference year for our forecast. This would push our model to overestimate by around 1 percentage point to 2 percentage points. In campaign terms, whilst Marine Le Pen will benefit from rising unemployment and the current wave of political discontent, her progression in the electorate will still be hampered by the restrictiveness of immigration policies put forward by Sarkozy over the past months. His most recent proposals to cut immigration down by half, to control family reunion or force a revision of the Schengen Agreement would then show a great level of consistency with the actual immigration policy record of his government during 2010 and 2011. 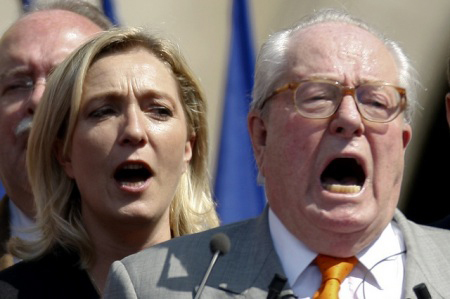 Many commentators point to obstacles to the FN and Le Pen which hamper presidential progress. There have been disproportionate amounts of media attention for the Sarkozy and Hollande: according to the French Media Authority (CSA), they have accumulated no less than 60% of air time between them since January. For its part, the FN struggled to obtain the required 500 endorsements from elected officials or parrainages, leaving little time for campaigning in the field. The campaign has also been beset by a number of controversies casting doubt on the ‘normalisation’ of the FN: Jean-Marie Le Pen’s contentious quotation of Brasillach, the far right Vienna ball and racist caricatures on a FN blog, for example. However, none of these is specific to 2012 – these are elements which have featured in every presidential campaign since 1988. In that sense, we would not place too much store in their effect on our model. It is unlikely that the UMP candidate will fully replicate his successful bid of 2007 and take the FN well below its current polling waterline. There are two main reasons for this: first, the degradation in France’s socio-economic context since the outbreak of the financial crisis in 2008, most dramatically the rise of unemployment; second, a high level of political dissatisfaction as revealed by Sarkozy’s popularity figures. However, the limited impact that the new FN leader has had to date suggests that the 2 per cent bonus in our estimate may be generous, and indeed the softening of the protest profile could itself challenge the presidential bonus. How Marine Le Pen campaigns in the next four weeks will determine the normality of her score as an FN candidate. This article was originally published on our partner site, the London School of Economics' EUROPP - European Politics and Policy blog (http://blogs.lse.ac.uk/europpblog/2012/03/27/french-elections-le-pen/).